Synopsis: All that matters to 15-year-old Nobara Sumiyoshi, an amazing athlete with big-time ambitions, is volleyball. But sometimes, it seems like a girl just can’t get a break in the competitive world of high school volleyball. Nobara’s family wants her to inherit the role of a “young mistress”, serving rich patrons at her family’s old-fashioned Japanese restaurant. No thanks! When Nobara transfers to Crimson Field High School, known for its top-notch volleyball team, her mother does not hesitate to use dirty tricks to keep her off the court. 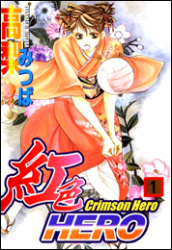 With the help of her feisty Aunt Momoko, who has connections at Crimson Field, Nobara decides to start playing offense.